Convenient set with Welch Allyn's high-quality diagnostic instruments. The Welch Allyn 3.5v Standard Ophthalmoscope uses Halogen light for true tissue color and consistent, long-lasting illumination. It comes with 6 apertures for general and specialist use and 28 lenses from -25 to +40 diopters for better resolution. 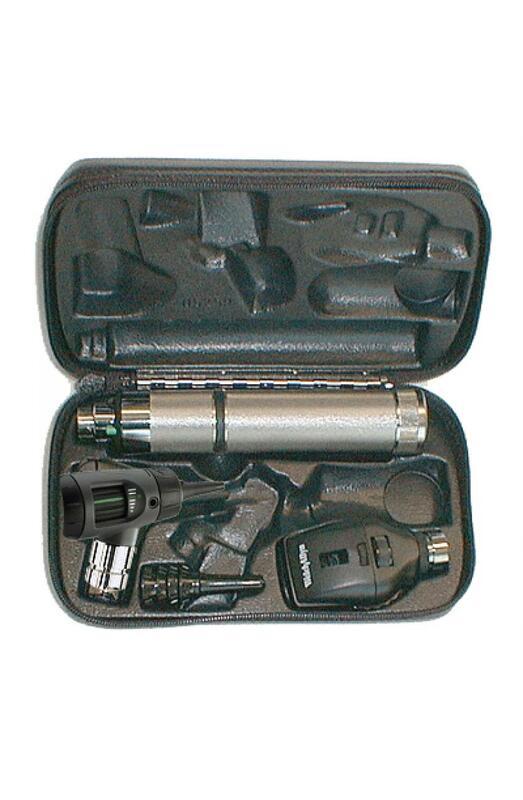 Otoscope uses Halogen HPX lamp and fiber optics for cool light with no reflections, no obstruction. It comes with a wide-angle viewing lens for instrumentation under magnification. Universal handle accepts all Welch Allyn 3.5v instrument heads. Chrome-plated brass handle rests comfortably in the hand. It comes with an adjustable rheostat control; smooth, knurled finish; and safety switch to prevent accidental battery drainage.